Food is a big part of Smart’s studio culture, but sharing meals can be tricky when we all have different schedules. As part of our ongoing exploration of how products can harness the Internet of Things to keep people connected, we focused on lunchtime in the New York studio. The Apron Alert project is a concept that emerged when we combined our experiments in wireless devices with our thoughts around improving our communal kitchen experience. Wireless XBee radios attached to Lilypad Arduinos were used to build a “smart” apron that can sense when the cook has put it on to start the meal, and when he or she has removed it to serve it. In response, the apron triggers a series of tweets or text messages to let people know when a meal is being prepped and when it’s time to come to the table. 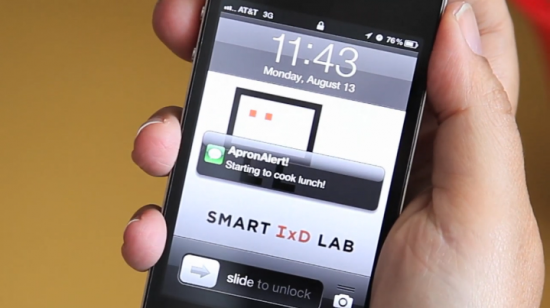 Above is a short video showing how we used our Apron Alert system to coordinate an office lunch this week. Special thanks to Mark Breneman for his work on this project. Thanks also to Evi Hui, Nicholas Lim and Edouard Urcadez.